I do visit fishing forums from time to time to read what other fisherman/women talk about and what their opinions are on a variety of topics or simply to share experiences and tell tall tales. Recently though, each time I visit these places it gets my dander up. It seems that there can’t be any half decent conversation anymore that does not end up with folks pointing fingers at each other. Flyfishers squabble with bait and lure fishers and visa versa. 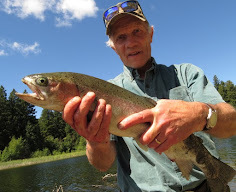 Mostly the argument starts by a flyfisherman telling somebody that fishing with fly tackle is what makes a real fisher or that flyfishing is more ethical and noble sport than any other form of fishing. If you think that only flyfishers turn their noses up at others think again. The boat paddles the other way too. Lure and bait fishers have no hesitation to belittle fly casters as elitist or hobby fishers depending what the mood strikes. Here in British Columbia you’re well advised not to mention the word bass, as in bass fishing. You’re liable to unleash a mighty storm of insults against you. Bass here in salmon heaven is what a rat is in a grain silo don’t you know. Since this is my blog I am going to tell you honestly what I think about the endless and pointless squabbling. It’s an insult to every fisherman and more than that it is utterly counterproductive to the future of fishing in general. Many young and novice fishers seek information and advice on Internet forums. Ask yourself, What must newcomers to fishing think if they read all that trashing ad nauseam, page after page on public forum none the less. Do these opinionated people really think that they can educate and promote ethical fishing by slandering others that do not happen to share their views or type of fishing method? I tell you what it will do. This childish behavior will drive interested people away. Who in their right frame of mind wants to associate with a kindergarten? Nobody. Everybody that knows me from this, and my other blogs, or in person, knows that I don’t give a rats hairy behind how and for what species or motivation a person fishes as long it is legal and you enjoy it. I, for one, am pretty tired of all that childish picketing and squabbling that exactly parallels the equally childish and pointless crossbow v. vertical bow controversy. Does it really matter what motivates a person to fish ? Is it important what tackle and tactics a fisher prefers to use? Is a person stalking a salmon with a fly rod nobler than the fisher fighting a big bass out of a lily pond? Of course none of it matters or makes one dime of a difference. Unless you think that God personally has approved of your fishing method and opinion you formed of it. Here is how I see it. We’re all fishers. Not one single way of pursuing our activity is superior, nobler or privileged than another one. We’re all equals. No one of us deserves any more or less consideration than any other legal fisherman. Do you all get that? Now I suggest that we all head out to our favorite lake or river and do some fishing, and if we see another fisher say hello and wish him or her luck. I said my piece on that subject and hope some of it sticks with you and made you think. To that end I leave you with a quote that I wrote in an article about the crossbow controversy. I find the quote equally suitable for this topic. "Wouldn’t it be wise for us to be more tolerant of each other and pick our battles with the ones that really threaten our way of life?" You're so right Othmar, and I wish more people could see things the way you do. I get tired of the squabbling too, that's one reason I've cut down on the forums I visit. As you also said, we should be concentrating on fighting those who are working to end our hunting and fishing privileges, not fighting with each other. Good stuff as usual, Othmar. This is something I've often gotten frustrated about - who am I to tell someone that the way they enjoy the outdoors is not as good as the way I enjoy?! That's just a ridiculous thought. Thanks for your thoughts. Thanks guys. I am glad that you seem to think as I do on the subject. At times these childish behavior gets me so bad that I think I must be the only mature person. The bigger problem I have with it is that all this useless wasted energy and time would be better spent promoting the outdoor sport in a positive light and helping newcomers. I know of at least three instances where squabbling has actually scared newcomers away because they were simply afraid to even ask a simple question. No wonder when they see fishers going at each other like two mad bulls just because either of them pursues a different method of fishing. This was a great, great post. I honestly hardly visit forums anymore just because of this issue. I do have to be honest though and say that I participated in conversations such as this or the cross-bow issue, but in the last year have decided how completely wrong I was, and even wrote a post about it. I think as long as what you are doing is legal and so be it. I wish anyone who ventures into the outdoors good luck, and I hope to hear a good story about their experience when they return. Your quote is right on as well. The anti's are all united and we need to be or they will defeat us. Thanks for the insight, and again, a wonderful post. Othmar - A very, very good post! Well put, my friend. I used to spend all my time tossing flies at Idaho trout. I became sick of the "Aura" flyfishing represented and stopped cold turkey. I started tossing Rapala's and enjoy myself very much now also. Just goes to show there is more than one way to have a happy hook up. Arthur and Eagle eye thank you all for the comments. I am really glad that you, like the posters before you, share my opinion. I sincerely hope that we can influence others to be more tolerant and respectful. That way everybody can enjoy this great sport without fear of ridicule. Hi Othmar. Just finding your blog and enjoying much of the content. Here's one of your paragraphs and a few insights of my own. "Does it really matter what motivates a person to fish?" Motivations matter when they affect a person's behavior and when those behaviors either help or hurt others. In that sense, yes, they are very important. Motivations are also unlikely to change much so I agree they are a bit of a non-starter. "Is it important what tackle and tactics a fisher prefers to use?" No. Not unless that tackle and tactics rolls down onto your neighbor or the fishery or the resource. We agree that snobbery over gear is one of the silliest things ever. Some of my favorite times fishing were spent using a handline. "Is a person stalking a salmon with a fly rod nobler than the fisher fighting a big bass out of a lily pond?" Not unless the bass fisher has moved the bass out of it's native range and is sucking up resources at the local DNR to support a fishery that is destroying native species. I'd fish for bass in BC with you, but I'd not spend much time trying to build up that fishery...quite the opposite. "Of course none of it matters or makes one dime of a difference." Hopefully you can agree with the caveats I've inserted. "Unless you think that God personally has approved of your fishing method and opinion you formed of it." Opinions tend to get overblown it's true. Theologically, however, it's pretty hard to escape the conclusion that God is very concerned with our ethics. It very much does matter whether or not we are being a good neighbor and careful stewards of the planet. Maybe God would have us spend more time thinking about data than opnions? Hi T. Book Smith. I appreciate you additions and thoughts on this article. You make some valuable point. However, the main subject and what I tried to highlight is not ethics but rather the senseless arguing and finger pointing among fishers for no other reason than to belittle another fishers choice of tackle or the fish species he or she pursues. What I tired to highlight is that we are all fishers. We all sit in the same boat – pun intended – we have bigger issues to tackle than to fight about petty little differences. I hear you Othmar, and I think we agree about most of that. Fishing should be judged by its' impact on the resource, not by the kind of tackle you use. ...if you're creeling them and you're not pressuring your local fisheries departments to spread them further or spend money managing for them, I think we're more or less on the same page.